Outstanding with big hot water tank. Water temperature always to be heat. ※Discharge 80 ℃ hot water for washing in 24 minutes. 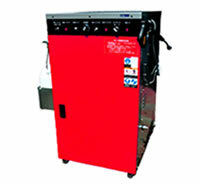 Hot water washing machine using in clean environment that does not put out the exhaust air. Advanced compact design and tough boby, appeared active in various place. Adopt special 3 layer reinforced resin body. You can use it for a long time. The emphasis on mobility by working at all. General industries, for food factory, building maintenance, restaurants, food service, livestock, farm use is not chosen. MR-10 is full model changes, easier to use. PSE certicification acquisition machine. Machine fit with "Electrical Appliance and Material Safety Law". It can be used easily at home at single-phase 100V power supply. Not choose location with compact and space-saving. You can also load a van. It is ideal for business trip work. ※ Please check the dimensions of door in the cargo compartment. Support from design in manufacturing and maintenance. 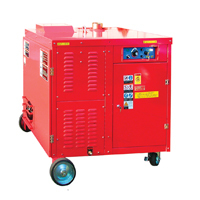 It is compatible with maintenance and quality of own domestic production goods. It shows the power of hot water in cleaning dirt which could not take away in normal water condition. Car maintenance, sheet metal, shipping company, taxi, motorcycle, bicycle. Agriculture, forestry, fishery, animal husbandry, poultry. Baths, hot spring, hotel, restaurant, food service. Building maintenance, paint, air-conditioning equipment, piping cleaning, roof washing. Civil engineering and construction, ship, aircraft, vehicle, food processing, production lines, various plants. 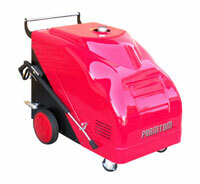 High efficient and outstanding washing power. 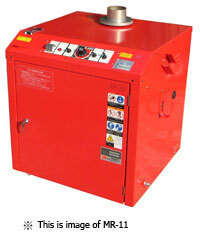 Luxury stainless steel boiler adopted, achieve economic work with reduced fuel consumption at a stable temperature. The balance of the ideal water pressure, saving time and cost. 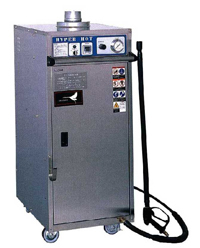 Depending on the application-dirt,can be set temperature and pressure. Labor - saving of maintenance work and cleaning at the same time clean and grease contamination, the adoption of ceramic plunger pump. Automatic maintenance, metal sheet, car wash, shipping company, taxi company, car maintenance motorcycle, civil engineering and construction, construction site, ship, aircraft, vehicles, food processing, production line, for each seed industry, agriculture, forestry, farm, animal husbandry, poultry, bath, hot springs, hotels, restaurants, school lunch, building maintenance, paint, air-conditioning equipment, cleaning inside the piping, parts cleaning, waste disposal industry. Is there any dirt that had been given up until now? The solution is 120℃ power. SUS304 stainless steel body, urethane casters, ideal for such as food factory. 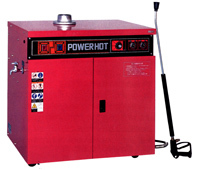 Even no electric power, still can use hot water !